It’s been well over a year since we moved into our house, and while progress inside the house has been a bit slower than I would have liked, I’ve been spending a lot of time out in the garden. It’s the first time I’ve had any real gardening space since I moved to DC more than 10 years ago, and I’m really really enjoying it. Last year I shared some of my plans for our outdoor space. Time for an update! Our house is a typical DC rowhouse: long and narrow. We don’t have a ton of space to work with, but I’ve been trying to maximize what we’ve got. We have a small garden bed in our backyard patio, which I’ve filled with lilacs, peonies, roses, and a few other perennial varieties. I save annuals for pots arranged along the fence on the other side of the patio so that I don’t have to worry too much about them once the cold weather sets in. Our backyard garden is my happy place in mid-to-late spring when the peonies and lilacs are blooming. Everything was late this year thanks to the neverending winter, but once the warmer weather arrived in April everything just exploded – especially my lilacs. I have a total of four lilac bushes, all planted in the back of the garden bed closest to the fence, and the smell was positively intoxicating when they all bloomed. I wish they lasted forever! I snapped some more photos a few weeks ago, at the very tail end of peony season, and with the exception of the peonies most of these flowers are still going pretty strong in the garden. We planted a border of pink and purple saliva in the garden bed, and my David Austin rose bushes bloom frequently as long as I deadhead regularly. I planted some impatiens under the rosebushes for a bit of added color, all of which seem to be growing quite happily. There is a small white crape myrtle in the back corner, which has been in bloom the last few weeks and I hope will grow to provide some much-needed shade over the next couple of years. Since these photos were taken, some yellow dinner plate dahlias have grown in around the peonies and are slowly taking over the garden much to my dismay – I need to do more research on (successfully) growing those big monsters! We also have a few potted strawberry plants – Sophie LOVED picking the fresh berries when they were in season. There’s a small bed that runs along the stairs down to our unfinished basement, where I’ve planted a wisteria vine – which surprised me by blooming the tiniest little wisteria this spring! – and a few other partial-sun perennials. I’d love to eventually build a pergola over our back door and train the wisteria to grow over it. I also have a small potted viburnum; I’m waiting for it to get a bit larger before transplanting to its permanent home in the front garden. Potted plants along the fence on the opposite side of the backyard. We recently added a few marigolds (to help deter flower-eating pests), a dark purple opal basil plant, and a couple of zinnia for some additional summer color. 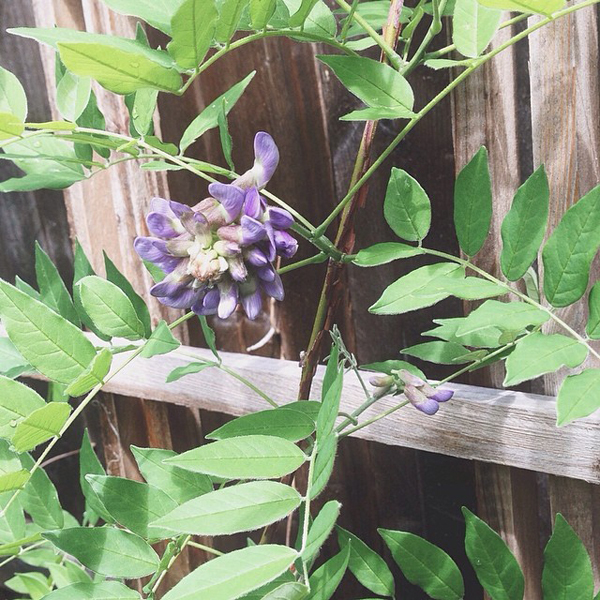 The clematis vine is one of my favorites in the entire garden. The flowers are so romantic! Future plans for this area include a vertical herb garden and possibly a small vertical vegetable garden – next year! Finally, another small partial sun garden bed that runs along the path next to our garage. I planted a hellebore, some jasmine, a couple of Japanese painted ferns, some impatiens, begonias, purple coral bells, and a bleeding heart all the way in the back (which is now the size of a small hydrangea!). I love love love the combination of the painted fern and impatiens! And that’s our garden – at least for the moment! Sadly, along with DC summer heat and humidity, the mosquitos and earwigs have arrived in force. The mosquitos in particular make it difficult to enjoy the backyard for long periods of time, so I haven’t been spending as much time outdoors as I’d normally like to. I’m trying to learn more about garden pest control in general, since I’ve also battled rose slugs and normal slugs in the backyard. We’ve also been contending with an infestation of the horrible-sounding Dead Man’s Fingers in one corner of the garden bed. It pre-dates any of the plants in the garden bed (we started fresh when we moved in last year), so I’m worried there might be some dead tree root buried deep in the soil causing the fungus. Anyone out there have any experience successfully battling Dead Man’s Fingers?? I have so much to learn about gardening! Eeeeek!! You’re peonies are sooo splendid looking, I love them! I’d love to have peonies one day when I get some actual land, they are such a lovely flower. Love the ferns too, it’s looking great!